Shortly after the NFL unveiled this year's Color Rush uniforms for Thursday Night Football, EA SPORTS confirmed those same uniforms will be coming to Madden NFL 17 later this week. UPDATE - The Color Rush uniforms are now part of Madden NFL 17 included in game update 1.04. 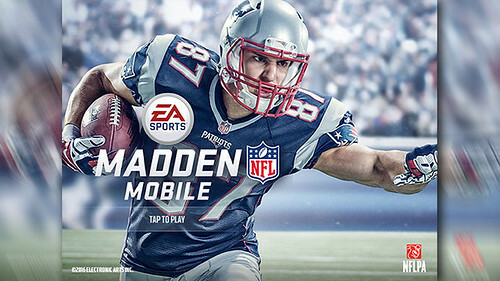 The third season of Madden Mobile will launch Tuesday afternoon and to prepare fans for the new modes and improvements, EA SPORTS has put out a blog and video detailing the changes. While popular modes such as Live & Blitz Events and Leagues return, the new version of Madden Mobile will feature a QB Scramble mechanic, new Gameplanning mechanics, and improved set/binder management. The release of Madden NFL 17 on EA Access is just days away and only a few more beyond that for retail release. If you're looking for early gameplay, feature breakdowns, and tips, EA SPORTS has allowed numerous GameChangers and YouTube personalities to release early videos of the game. Selecting songs for a game soundtrack can be a daunting task as satisfying the musical taste for a large user base can be next to impossible. However, in an attempt to tackle such a challenge, Madden NFL 17 will feature 40 songs across a variety of genres including rap, rock, and country. 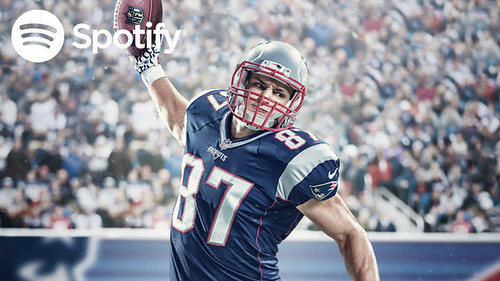 Some artists featured on the soundtrack include 2 Chainz, 3OH!3, Blake Shelton, Jason Aldean, Fashawn, and Logic. 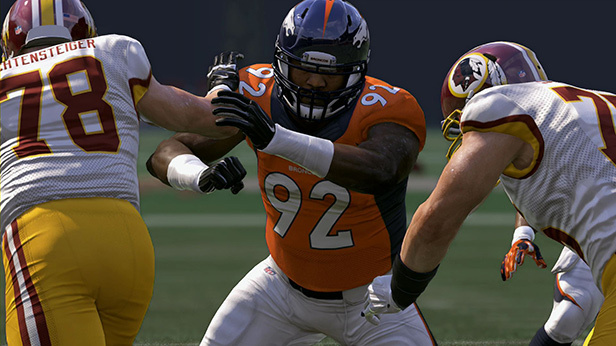 The ratings reveal is underway for Madden NFL 17. Four players will begin the year with a 99 overall rating: TE Rob Gronkowski (NE), MLB Luke Kuechly (CAR), LOLB Von Miller (DEN), & RE JJ Watt (HOU). 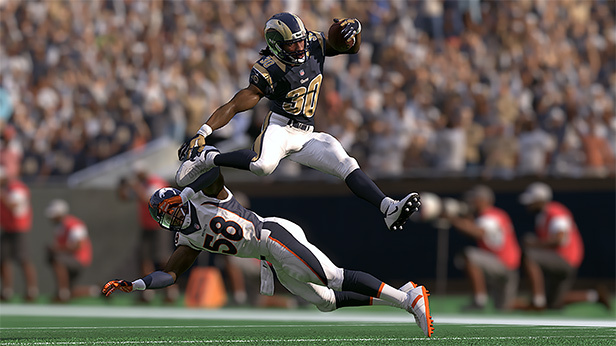 The fifth highest-rated player is DT Aaron Donald (LA). View and search entire player rating database here. Perhaps the most widely discussed community question/topic following the initial release of Madden NFL screenshots come from fans wanting to know what new gear and equipment have been added to the game. This is no exception in Madden NFL 17. 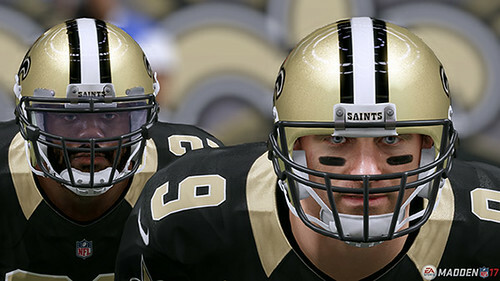 Disclosed in a developer blog, M17 will feature new helmets, facemasks, gloves, cleats, and also some new accessories. 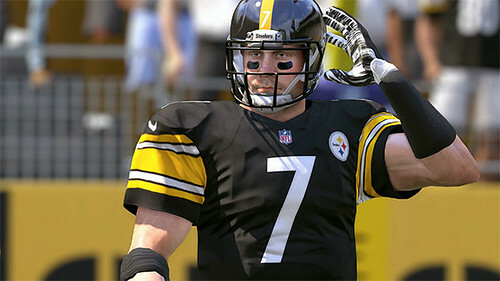 With Madden NFL 17 including full roster editing, the increased amount of apparel and equipment will help users customize players and visuals to their liking. Coaches have also been given updated and accurate gear packages to make them look more realistic as well. 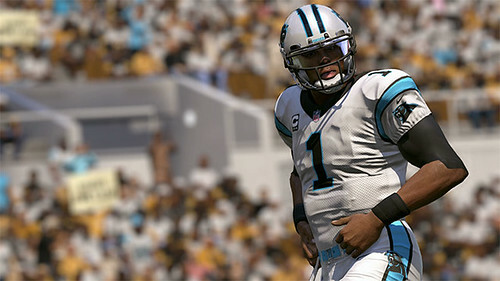 Just ahead of EA Play and E3, EA SPORTS has released two lengthy blogs on the improvements coming to Franchise Mode in Madden NFL 17. 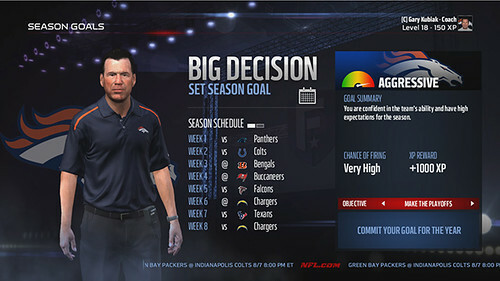 Part two of the Franchise blogs focuses on Big Decisions, a methodology that surfaces important decisions the user must make, and some of the top community requests added to the game, such as an in-game score ticker, full player editing, and practice squad. As Franchise Mode has underachieved - and been underdeveloped - in the eyes of many the last few years, M17 aims to change that by satisfying some of the biggest community requests. 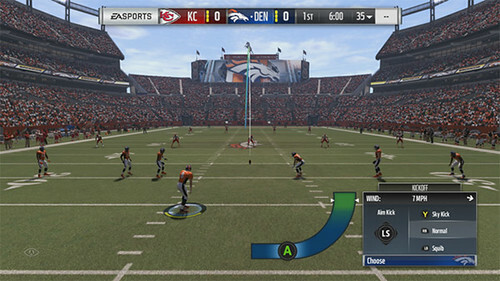 An in-game score ticker will help keep users connected to other games that week in the Franchise, even updating other user scores (if game is completed) during the action. Commissioners have the ability to fully edit rosters, including player ratings, appearance, and even contract terms. Highly requested, each team now has a practice squad, allowing them to develop ten players but be careful - as in real life, these players are essentially free agents and can be poached by other squads. Big Decisions surface the major options and choices a user must make during the course of a season that, if they existed prior, were previously hidden or buried in menus. Now, they are brought front and center. 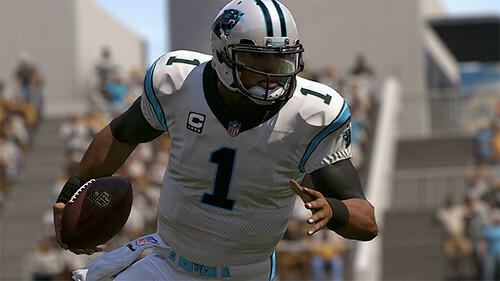 Just ahead of EA Play and E3, EA SPORTS has released two lengthy blogs on the improvements coming to Franchise Mode in Madden NFL 17. 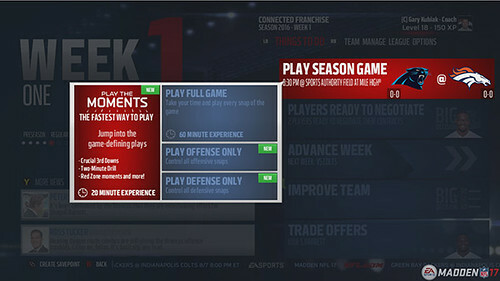 Part one of the Franchise blogs focuses on features that help to streamline the experience/playing time within the mode and also changes to the weekly Game-Planning feature. To help users play through more games at a faster pace (or avoid getting bored by full games), Play The Moment will allow users to hop in and play the game-defining or manually selected situations. As the game simulates towards each possible Moment, the user can select from variable simulation speeds. SuperSim has been improved both visually and behind the scenes. The engine will now try to always reach the NFL-average of 120 snaps regardless of quarter length. 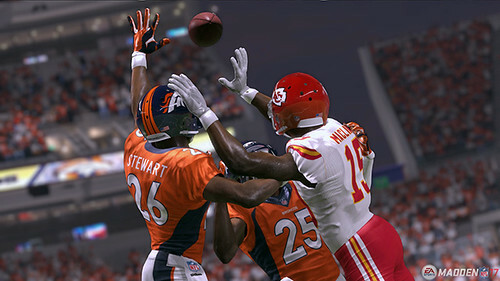 Oft-criticized in the past, Game-Planning is now more efficient and helps to prepare the user for their foe each week. Game-plans can be selected that can take away the opponent's strength, highlight the user team's strength, or give XP to positions of need. Users will see Tendencies for their foe each week that they can practice for with specific drills. If the user completes/masters those goals, they can receive in-game boosts when calling those particular plays. Madden NFL 17 continues to innovate by becoming more accessible to those with vision issues with options to enlarge graphics, colorblind support, and brightness/contrast controls. Similar options have become common in major titles, but sports franchises have been slow to adjust until now. With many Madden NFL fans becoming tired of the long-time commentary from Jim Nantz and Phil Simms, M17 will feature a new commentary team of Brandon Gaudin and Charles Davis. 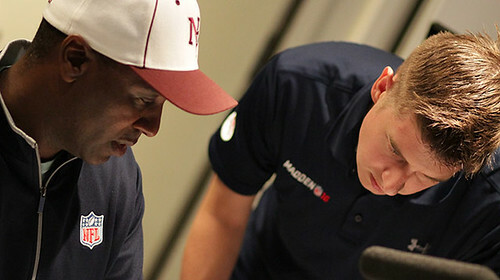 Gaudin has recently covered Georgia Tech athletics while also working for Westwood One and the Big Ten Network. He is most recently recognized for his radio call on the Miracle on Techwood; Georgia Tech's improbable last-second victory over Florida State last season. Davis is an analyst for the NFL Network and Fox Sports. Both men have spent several days each week recording lines at EA Tiburon leading to unprecedented depth in game commentary. In addition, this access will include the ability for additional commentary to be recording during the season and implemented into the game. Former tournament competitor and current Tiburon Quality Analyst Will Sykes has written a blog detailing some of the gameplay improvements will improve the quality level of competitive play in Madden NFL 17. Among the highlighted features: man and zone coverage improvements, 'Spy Crash,' some formations (EX: Quarters) less effective vs. the run, ball-carrier special moves, improved quick audibles, improved pass blocking logic, and improved online play stability. Fans long clamoring for improved defensive (& defensive AI) in Madden NFL may be getting the biggest improvement in franchise history on that side of the ball in M17: a new zone coverage logic & AI architecture and new user mechanics, among others. Previously in the series, zone coverage was written independent of the play with defenders dropping to a spot on the field and then prioritizing whom to pick up while utilizing only three underneath zone coverages (flat, curl flat, and hook). Madden NFL 17 features ten new zone coverage assignments with each possessing proper rules and logic designed for specific coverages. This will allow defenders to make progression reads, aka pattern matching, also aided in part by the new 'Receiver Count' system. In Coach Cam, the play art will include the name of the underneath zone inside the zone art. The blog breaks down the ten new zone assignments, how they are used, and the routes they best defend against. A future blog on zone coverage improvements will cover progression reads for zone defenders in Tampa 2, Cover 3 Match, and 3 and 2 Deep fire zones. 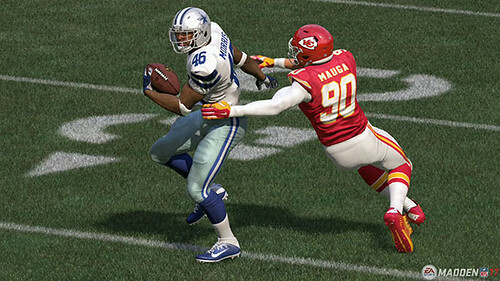 Special Teams have long been considered nothing more than a mundane task in the Madden NFL franchise, however changes detailed in the latest developer blog appear to aim towards changing that. 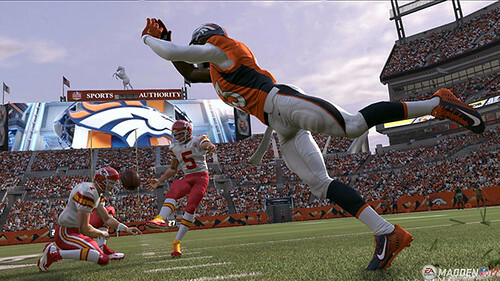 Coming to Madden NFL 17 are a new kick meter, special team trick plays, and the ability to block kicks. New Kick Meter - A new 3-click meter similar to that found in baseball or golf titles will require the user to begin the kick, click at the top of the meter to establish power, and then finally press again at the bottom of the meter for accuracy. The more power on the kick, the faster the meter will drop potentially hurting accuracy. Along with this, users will have the option to select for the kick to be normal, sky kick, or backspin (punts)/squib (kickoffs). The blog mentions that kicker ratings will have a bigger impact in the game this year, but does not go into detail on how exactly. It is assumed that lower accuracy will result in a smaller window and/or faster speed on the drop following the button press for power. Trick Plays - Playbooks will feature more modern special teams trick plays (run and pass) from both field goal and punt formations. A specific example mentioned in the blog is the fake field goal touchdown pass by Seattle versus Green Bay from the playoffs several years ago. Special team trick plays are designed to be counters/more effective versus blocked kick attempts and not as a standard offensive play. Block Kicks - Previously, the only chance for a blocked kick came as a result of user exploits. In M17, the development team has implemented "a system that has very tight control over frequency and success chances." On designed block plays, the 'kick blockers' will have a B icon over them on pre-play art. Selecting one of these players and timing the jump the snap mechanic properly will give them a chance at breaking through and challenging the kick. It's not just ball-carriers getting improvements in Madden NFL 17 as the defensive AI (vs. run & pass) has been vastly improved along with the addition of gap control. Alignment, assignment, and technique all matter in the new run fits system. To help with alignment, the game has added a new defensive auto-flip feature. When ON, this will see the AI automatically flip the defense when the offense flips so that the defense aligns against the strength of the offensive formation. The entire defense, coverage, or front could flip depending on the defensive play call. Each play-type has it's own 'flip rules' to make this determination. While individual defensive gap assignments will be shown pre-snap, it doesn't mean that will be the gap assignment the entire play. Players will react to the action and update their gap throughout the play. The Play Recognition Rating is very important as the higher the rating, the faster the defender will break out of the new 'read & react' animation to fill their gap. New run-fit techniques help make defenders play their gap authentically. These techniques include: Force, Cutback, Fill, Jet, Crack-Replace and 2-Gap. 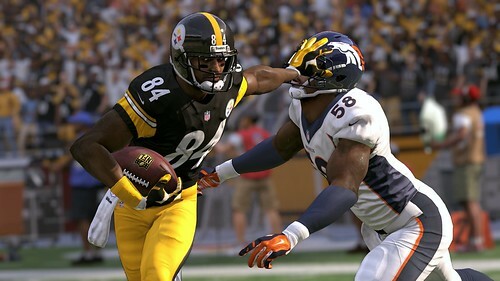 Madden NFL 17 continues the recent trend of deepening the available controls and ball-carrier moves to give more user-depth and allow those with great stick skills to pull off more moves. Special moves are spread out in M17 based upon playing style and ratings, letting bigger backs perform more effectively at stiff arms and truck moves, while smaller backs are more proficient at spin moves and jukes. The animations will also play out at at different rates/success, meaning some will be very smooth/effective (Elite) and others not as smooth (Lumbering). Should a player be fatigued, they will be less effective at performing special moves regardless of ratings. As eluded to in the initial feature overview, ball carrier mechanics include standard moves, speed modifier, precision modifier, and utility moves (with some of those being steerable). New mechanics are also included to help provide user feedback. Recommended special-move prompts will tell the user the recommended move/button which they can press or ignore, should they choose. On lower difficulties, special move feedback text will let the user know if the timing in the fakeout window was early, perfect, or late. An under-rated addition is the projected path indicator which will show the current path/direction the ball-carrier is headed based on their stick-input. This is beneficial behind the line of scrimmage in making sure the user is hitting the intended hole and also beyond the line in seeing if they are heading wide of an oncoming defender. Ball-carrier special moves can be set to auto (CPU will execute moves), assist, or manual (user in control of all moves). 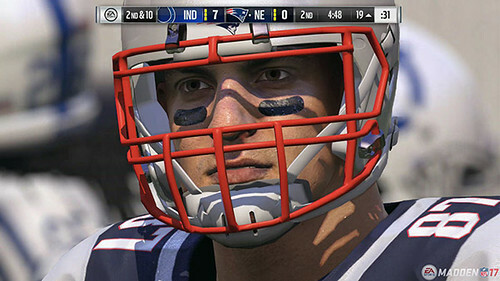 With the reveal of Rob Gronkowski as the Madden NFL 17 cover athlete, EA SPORTS has also disclosed some early information on the game's feature set. Ball Carrier Controls: Depending on the player's attributes, players have a have tiered system of special moves that can be executed. Bigger backs are more effective at trucking defenders while smaller backs are more effective at jukes and spins. UI Prompts will indicate the moves available at that instance and on lower difficulties the moves will be automatically executed. The new Path Assist will help users see exactly what hole they are heading towards and also their current path downfield. New Defensive AI incorporates gap play, force defenders, and improved zone coverages. Defenders are more properly aware and following assignments than ever before, meaning the offense must be able to read defenses in order to be successful against top competition. Special Teams have long been considered automatic - if not downright boring - in Madden NFL (and NCAA Football before it), but a new Kick Meter (& kick options), ability to ice the kicker, trick plays, and a block kick mechanic will add a new dynamic to the third phase of the game that has long been missing. 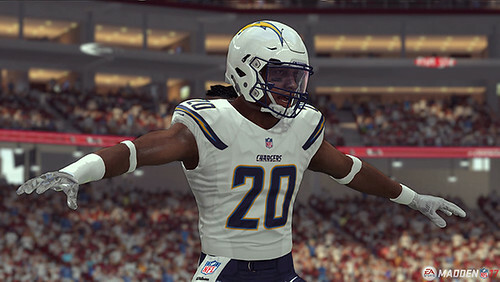 Lacking any additional details at this time, EA SPORTS is also touting a redesigned and deeper than ever Franchise Mode.